Scottish singer-songwriter Nina Nesbitt is back with her sophomore album The Sun Will Come Up, The Seasons Will Change via Cooking Vinyl. When asked how the 13-track album came about, Nina said she often wrote for other artists and would come back home and write for herself. She realized how much she missed writing songs that told her own story. The album has a very electronic pop, dreamy feel. Her sound is magnetic; it’s multi-sensory. You feel the sun, you feel the cold, you hear a glistening pool, and some rain. You see lotus flowers, you see snowflakes, you see clouds moving. “The result is an iridescent work of pop mastery, showcasing Nesbitt’s proficiency as a songwriter, vocalist, and producer,” says Billboard. Watch her new music video for “Is It Really Me You’re Missing?” which premiered alongside her album launch this morning. End your week in this dreamscape and hope you get to see Nina while she’s on tour in a city near you! That’s right your information is correct — G Herbo is indeed Still Swervin. 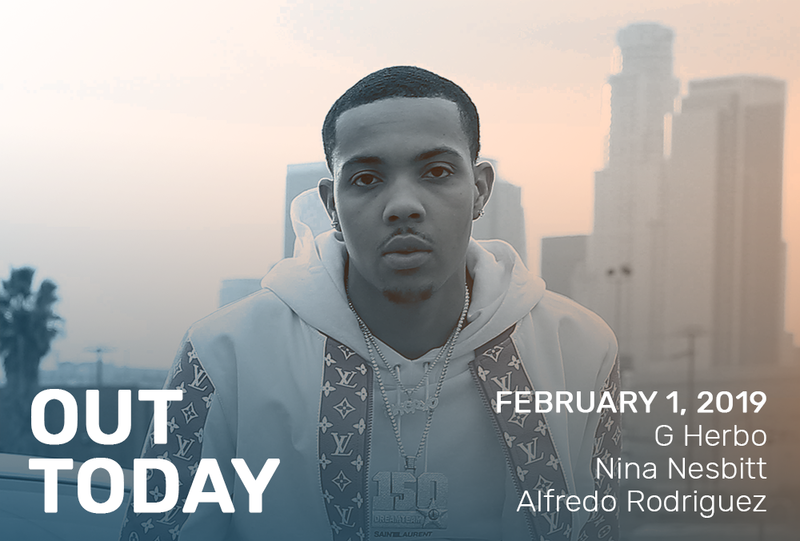 Produced in its entirety by Southside and released via Machine Entertainment, G Herbo drops his follow up to last year’s Swervo (you may remember us covering that on a pervious Out Today post). With back to back features from GUNNA, Juice WRLD, Pretty Savage, Lil 40 and more, this album is guaranteed to get the hip hop world talking. G keeps his fans excited as he continues to work on projects with the best of the best. Check out the new single “Up It” below, which has already ‘up’ed its way to 1.5 Million views. Don’t forget to blast Still Swervin, out now. Grammy-Nominated pianist and composer Alfredo Rodriguez releases Duologue today via Mack Avenue. Written and performed alongside Pedrito Martinez, the pair feed off of each others creative energy to develop a unique texture that is both uplifting and classic. With roots based in Cuba, Alfredo and Pedrito bring about a sound this is bright and soulful with melodies that float seamlessly with a taste of Latin. As NPR‘s Felix Contreras states, “Setting Martinez’s inspired vocals against a patchwork of beats — including a bit of jazzy funk, as well as Afro-Cuban santería references — Duologue reminds us that the piano is considered a percussion instrument.” Produced by the legendary Quincy Jones, get the full story behind Duologue below and listen to the album now. There ya have it! We’ll be back next week with more releases. In the meantime, this week’s music will keep you busy. Happy listening!